Too Conscious For Dessert? This Home Baker Is Delivering Guilt-Free Desserts & More! Looking for a switch from those deadly calories but not the taste? We found this awesome, professionally-trained pastry chef who’ll help you satiate your cravings without any guilt. Miha Treats, the brainchild of Chef Madhavi Mukherjee is baking mouth-watering desserts, breakfast goodies, and more which will suit you whether you’re health conscious or just a hogger! Miha specializes in making desserts that are healthy and tasty at the same time! From regular favorites like the chocolate chip or Snickerdoodle cookies to ultra-luscious shortbread cookies to amazing flourless double chocolate cookies – she covers them all. Having had a lot of experience in the food industry, Madhavi can put a spin of magic on tarts, brownies & more! 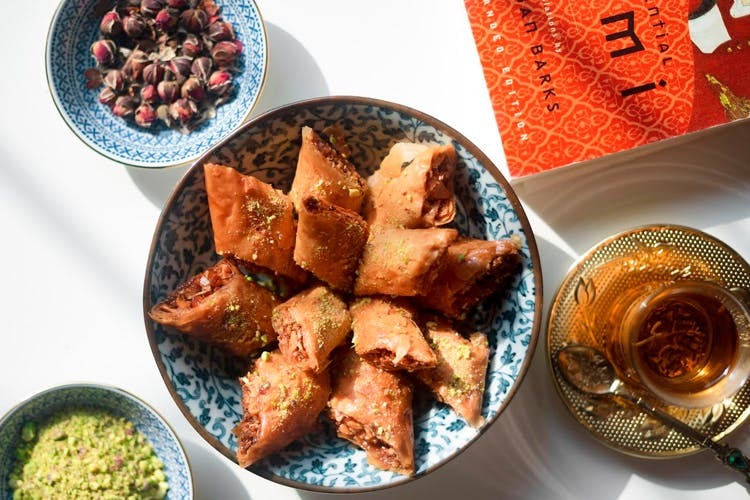 Her menu also offers Middle Eastern desserts like Baklava, a delicacy from Turkey along with Cheese Kunafa which is also a famous Saudi Arabian dessert. They’ve even got tea cakes & muffins that go along perfectly with your breakfast or as an evening snack (we love the apple cinnamon muffin and banana bread!). Don’t forget to feast on their amazing Cranberry-Pecan granola (best paired with yogurt)! They choose their ingredients very carefully and ensure that you get the best experience you possibly can. There’s a story behind every dessert. You can even follow Miha Treats on Instagram and try and master the art yourself as Madhavi frequently gives helpful baking tips! It’s official, Miha Treats is going to shower you with mouth-watering desserts and they’ve even found a way for all you health conscious peeps out there! Dial her on +919699206787or contact on her Instagram handle to place orders.